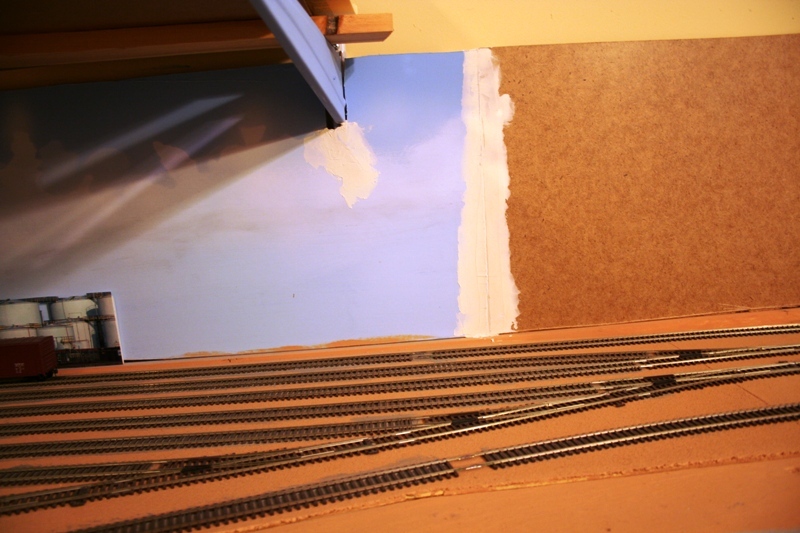 Added another section of Masonite hardboard to create more backdrop along the staging freight yard lead which will complete this area of the layout for the background base. The image to the left highlights the seam that was made using spackling plaster as well as patching a crack that occurred with the previous section. Once this has dried the Spackle will be sanded smooth and then the fresh areas will be painted with the light blue interior latex paint then more clouds will be added. The main reason for this project is due to the continued work on the locomotive servicing facility and backdrop structure progress. The Walthers Cornerstone Series(R) Background Building - Kit Bud's Trucking Co. (Walthers Part # 933-3192, 19" x 1-1/8" x 4") was completed a few weeks ago and needs to be moved to an area just in front of the new backdrop area. Once the new Masonite backdrop area is completed the scenery base for the area between that and the benchwork will be added to support the background structure. 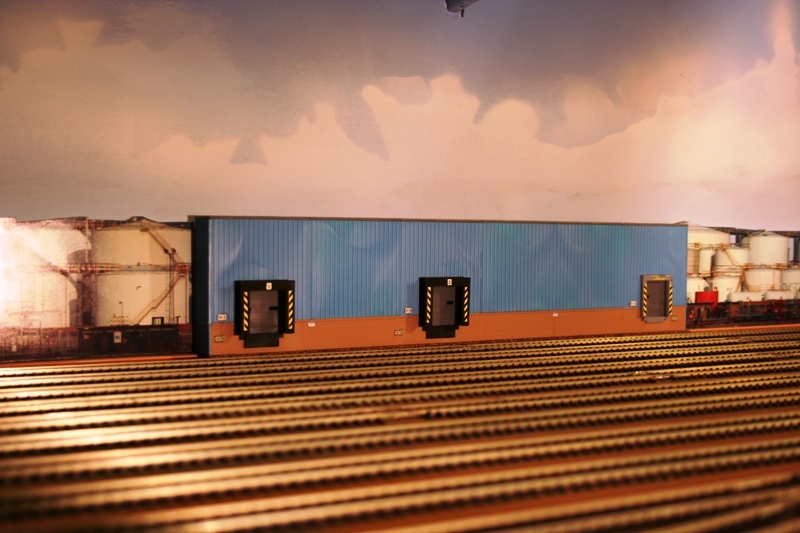 This kit is built as part of an Auto Plant, however, I have seen similar wall and foundation construction for cold storage facilities, I just need to get some roof top details such as compressors for industrial grade coolers and freezers to complete the model. Currently the model sits in the original proposed location, however, the width of the rubber gaskets that surround the loading doors encroaches onto the rolling stock clearance. Thus, the need to move the structure to the other location and contributing to and necessitating the backdrop work required prior to the move. I also have the Lauston Shipping model kit from the Walthers Cornerstone Series(R) Background Building - Kit Series (Walthers Part # 933-3191, 19" x 1-1/8" x 4") which still needs to be built, and it will likely be able to kit near the original section that the cold storage was to be placed. These kits are quick and easy to built and I recommend them for anyone who has backdrop requirements on their layout.